Top-fermented beer in Golden Ale style brewed with barley malt, a small amount of wheat malt, yeast and a mix of Slovenian hops, one of which is the Styrian Golding. Rich golden colour and intentionally opaque, it presents itself with a fine and persistent foam. You can identify herbal and citrus features, mildly spiced and fruity flavours due to the esters intentionally evoked by our brewmaster. Refreshing, easily drinkable and well balanced thanks to its dryness and final bitterness (which prompts you to try some more). An OPTIMIST is a boat intended for use by children learning to sail: light and breezy wherever the wind takes you. Unfiltered and bottle-conditioned it comes with a natural yeast sediment. Top-fermented amber ale in Irish Red Ale style. Intriguing amber ale brewed with 4 types of barley malt, a small amount of wheat malt, a mix of Slovenian and American hops and yeast. Drinkable but with a substantial body, slightly bitter at first followed by a sweet aftertaste. The malty taste dominates along with exotic fruit and eventually mild and pleasant liquorice flavours. Medium carbonation with a smooth and creamy mouthfeel. The amber red colour reflects the typical Istrian red soil and for this is called REDSAND Amber ale. Top-fermented IPA-style beer. Istrian reinterpretation (Istrian Pale Ale) of the Indian Pale Ale (British style) brewed with barley malt, a small amount of wheat malt, yeast and a mix of English and American hops which evoke an intense aroma thanks also to the additional amount of hops added in dry hopping. It presents itself in amber colour with abundant as well as creamy and persistent foam. The hoppy flavours varying from exotic fruit to citrus and floral elements are first perceived in the nose persisting throughout the mouth accompanied by a medium body. It resolves in a pleasant bitterness which recalls the flavours of grapefruit. This IPA doesn’t focus only on the hops (East Kent Golding, Chinook and Amarillo) but also on the malt (4 different types of malt). The result is a TORNADO of flavour. Light and refreshing top-fermented IPA due to the 5% alcohol volume but complex and aromatic due to the big quantity of hops used also in dry hopping. It presents itself with creamy and persistent white head. Light to medium body and light carbonation. 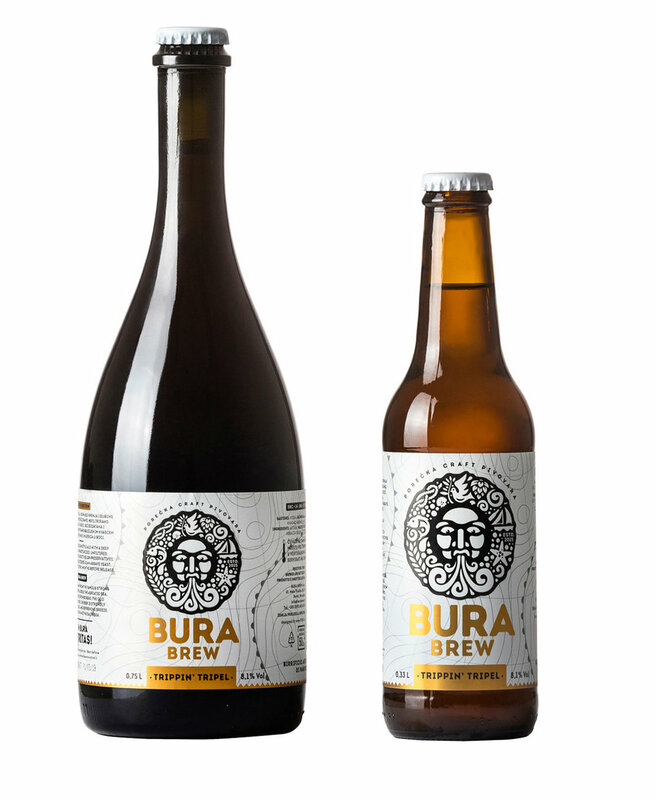 Compare to Bura Brew TORNADO IPA - ISTRIAN PALE ALE (hoppy and malty), in this HURRICANE IPA there is a higher quantity of hops that gives herbal and tropical fruit notes and the result is a HURRICANE of flavour with long and lasting bitterness. Limited Edition available in 0,33 and 0,75 bottle formats. Top fermented Belgian style ale with a deep copper colour, unpasteurized, unfiltered, bottle fermented (bottle conditioned). Fermented with selected Belgian Abbaye yeast. Maturation for 4 months in the bottle before release. Rich in taste and covered by a creamy head it begins with gentle spicy notes of ripe fruit. The taste of lightly roasted malt dominates in the mouth along with the fruity and spicy components deriving from the yeast and from the moderate use of hops. Full body also due to the alcohol content of 6,1% but at the same time easy drinkable. Medium carbonation and creamy mouthfeel with a light bitter aftertaste. Top fermented Belgian style ale, with a deep golden colour, unpasteurized, unfiltered, bottle fermented (bottle conditioned). Fermented with selected Belgian Abbaye yeast. Maturation for 3 months in the bottle before release. It presents itself with medium sized creamy white head. The nose perceives intense flavour of banana and pear along with honey and a hint of caramel. The mild spicy taste intensifies with a longer maturation. Medium body, it begins with moderate sweetness and ends with a dry finish due to the use of candied sugar. Light hoppy taste that provides a very moderate bitter aftertaste. The higher alcohol content of 8,1% is hardly noticed. Whoever wants to taste and buy our beer as well as find great gift ideas can come directly to the brewery. We sell boxes of 24 bottles, beautiful baskets of 6 or gift baskets with bottles and glasses. You can also buy our T-shirt with the Bura logo.